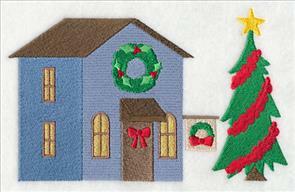 New machine embroidery designs add a cozy, classic look to your home for the holidays. 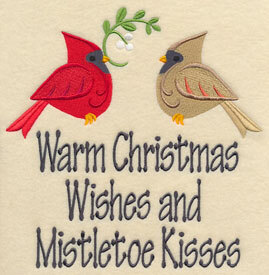 Sweet Christmas sentiments are paired with classic elements, such as wreaths, cardinals, and ornaments. 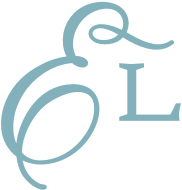 Energetic little birds decorate their homes with lights and bulbs. 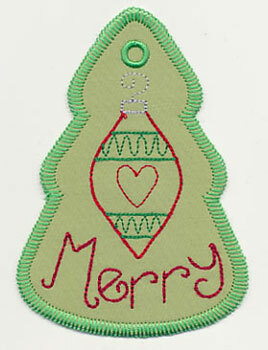 And, gift tags (made right in the hoop!) let you add an extra-special touch to your gifts. Bring a classic, traditional and heart-warming look to your home with these new designs! 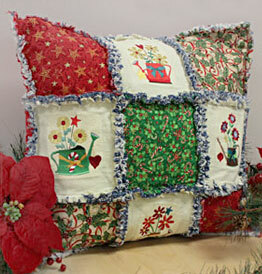 The classic and popular rag quilt style is used to make a pillow in this new tutorial! 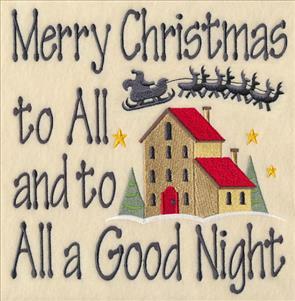 Heartfelt sayings add homespun charm to holiday pillow covers, wall hangings, and tree skirts. 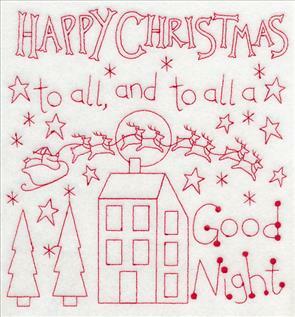 Fill your home with classic seasonal imagery and these warm Christmas sentiments. 7.81" x 6.83" and 6.71" x 5.87"
7.71" x 7.82" and 6.91" x 7.01"
5.86" x 5.94" and 4.86" x 4.93"
Ring in the season with sweet Christmas sayings! 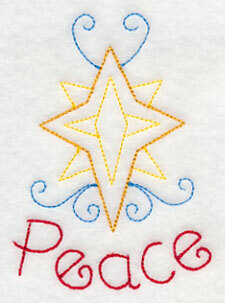 Stitch these holiday sentiments onto towels, shirts, and table linens. 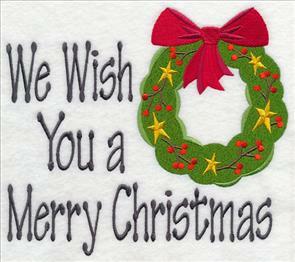 They'll add a holly-jolly feeling to your gifts and home decor! 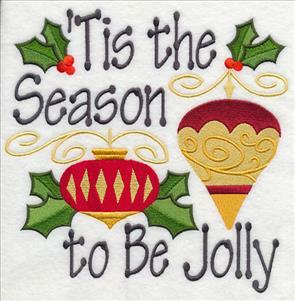 7.82" x 7.83" and 6.92" x 6.93"
7.59" x 7.83" and 6.93" x 7.15"
5.88" x 6.06" and 4.86" x 5.01"
Decorate your home this holiday with bright colors, stylish designs, and the sweetest Christmas birds you ever did see! 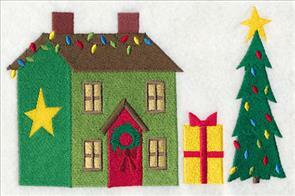 They decorate their homes for the holidays, and will bring their sense of style to your projects as well. 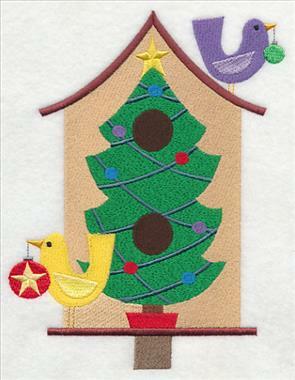 5.81" x 8.36" and 4.74" x 6.82" and 2.72" x 3.88"
These blissful birds are spreading holiday cheer by decorating their homes. They carry ornaments and lights to add color and charm. 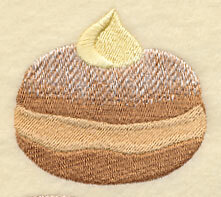 Add them to stockings, placemats, and bath towels for a festive touch. 5.85" x 7.52" and 4.83" x 6.22" and 2.99" x 3.86"
Make your home feel warm and cozy with these birdhouse designs. 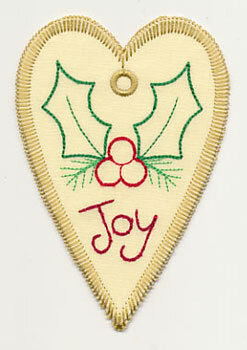 Decked with holly, candy canes, and stockings they're a perfect pick for wall hangings and holiday quilts. 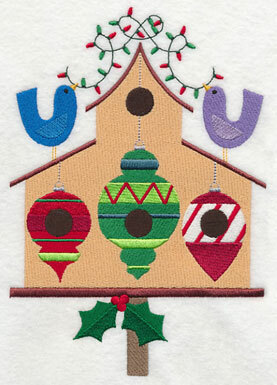 5.85" x 6.78" and 4.84" x 5.61" and 3.33" x 3.86"
These charming Christmas birdhouses are ready to deck the halls for the holidays! They're sure to bring festive color and charm to your gifts and home decor. Order them individually by clicking the links above, or buy all six in a pack. 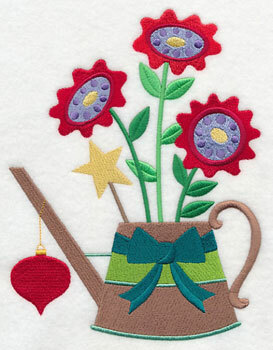 Add a lively look to Christmas aprons, tea towels, and table runners, with these delightful watering cans filled with bright and cheerful flowers. 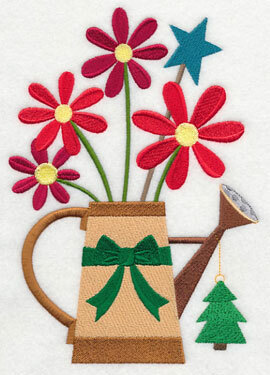 Grow holiday cheer this Christmas with dainty country flowers blooming from festive watering cans. 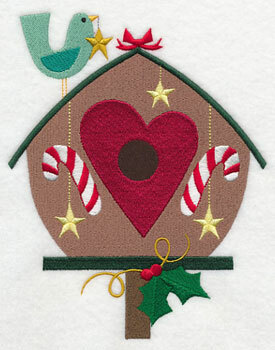 Hearts, ornaments, stars, and candy canes add an extra festive touch to these designs. 5.89" x 7.71" and 4.83" x 6.32" and 2.96" x 3.88"
Redwork designs are fast and fun additions to smooth fabric, like tea towels and quilter's cotton. 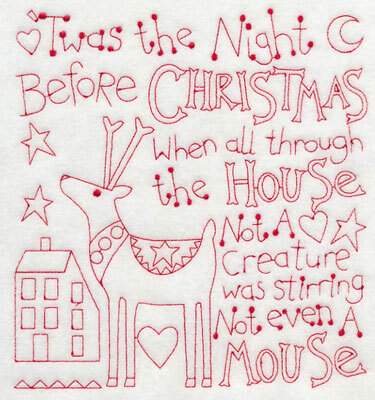 This design features the opening line from the poem A Visit from St. Nicholas. 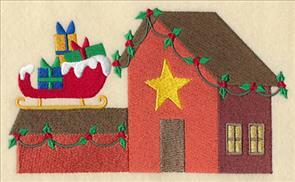 7.33" x 7.80" and 6.90" x 7.34" and 5.85" x 6.22" and 4.85" x 5.16"
Santa and his reindeer fly away, wishing everyone a Merry Christmas! 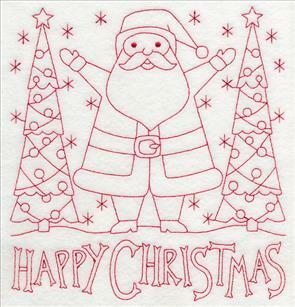 For those in Europe or Australia, a Happy Christmas version is available as well. 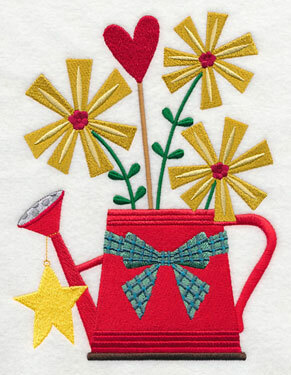 Add this light and lively design to tea towels, placemats, and wall hangings. Santa stands between two trees, wishing everyone the merriest of days. 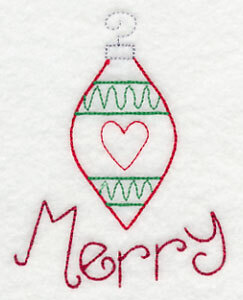 This quick-stitching design brings festive flair to quilt blocks and tea towels. 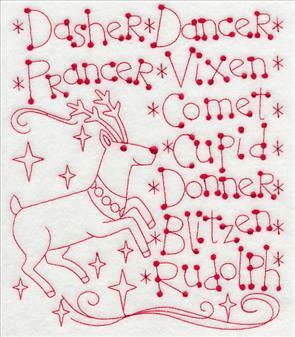 This design features a reindeer with the names of Santa's team. It's a sweet addition to your Christmas decor! The two designs are slightly different. The one on the left is from the song "Rudolph the Red-Nosed Reindeer." 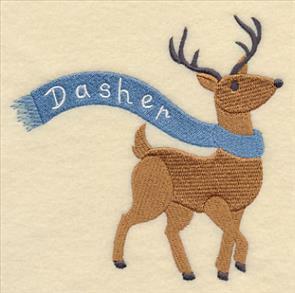 It names nine reindeer, including Rudolph. 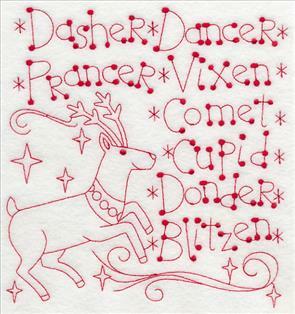 The one on the right names eight reindeer, and is from the poem A Visit from St. Nicholas. 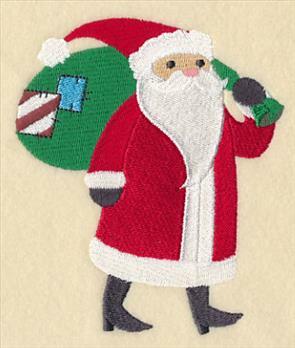 Santa and his sleigh brings Christmas magic to your holiday gifts and decor. 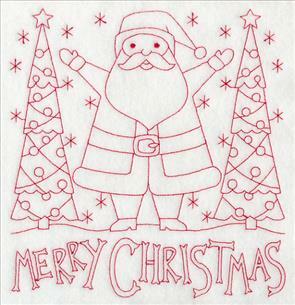 Stitch these classic designs onto stockings, tree skirts, towels, and table linens. 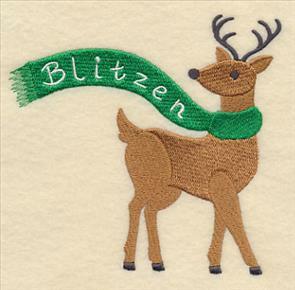 4.90" x 4.85" and 3.86" x 3.82"
Let your imagination fly high with Santa's favorite reindeer. 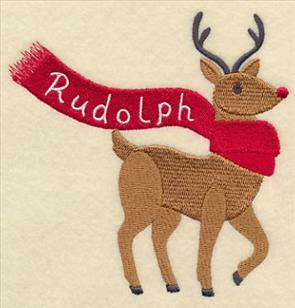 Rudolph's shiny red nose is ready to guide Santa's sleigh with Dasher close behind. 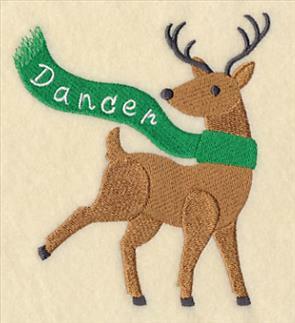 4.95" x 4.81" and 3.85" x 3.79"
Dancer and Prancer leap onto your projects, and add a merry and bright look to holiday decor. 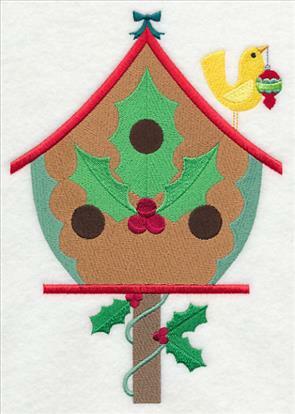 These designs are charming embellishments for stockings, holiday fashions, and tree skirts. 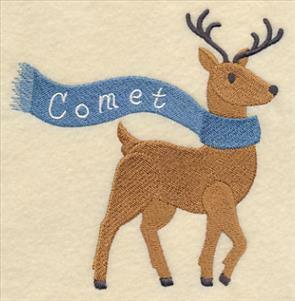 4.41" x 4.82" and 3.48" x 3.80"
Make your holiday festive and fun with Vixen and Comet. 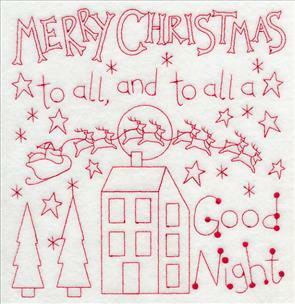 Add a dash of Christmas cheer to quilts and pillow shams with these designs. 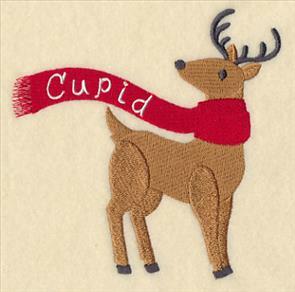 4.86" x 4.82" and 3.85" x 3.80"
Pair Cupid and Blitzen with other members of Santa's team and add them to tablecloths, mantle runners, and the borders of quilts. 5.02" x 4.76" and 3.93" x 3.75"
The 7th member of Santa's team has two names. 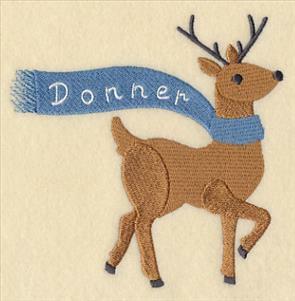 Donner is from the song "Rudolph the Red-Nosed Reindeer," and Donder is from the poem A Visit from St. Nicholas. Both are available to suit your project needs. 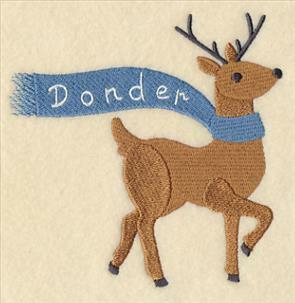 You can read more about Donner vs. Donder in this article here. 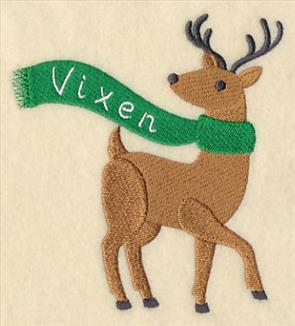 4.84" x 4.81" and 3.80" x 3.79"
Shout out with glee this holiday season, and stitch these charming designs onto your gifts and home decor. 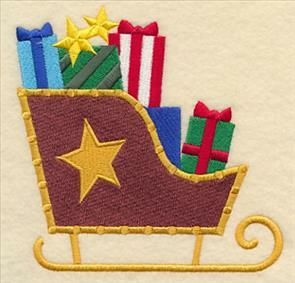 Add Christmas magic to tablecloths, mantle runners, and the borders of quilts with Santa, his sleigh, and team of reindeer. Order them individually by clicking the links above, or buy all the designs in a pack. 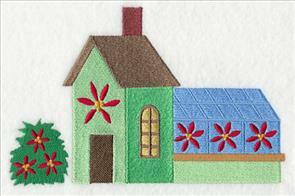 Before the days of machine embroidery, saltbox-style houses were used in hand-appliqued quilts. We use this style today to celebrate the primitive and country art form, and to bring a cozy look to home decor. 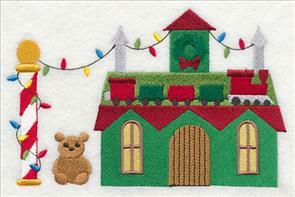 These designs feature Santa's village, imagined in a saltbox style. 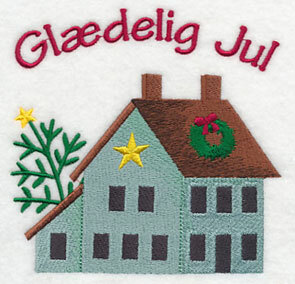 Cozy houses are decorated with lights, and wreaths. We imagine that Santa and Mrs. Claus live in the one on the left. And, right next door is where Santa keeps his sleigh, packed with presents and ready to bring holiday cheer. 6.82" x 4.05" and 3.86" x 2.30"
Other buildings in the town include a toy shop, and a stocking shop. Elves have been hard at work making toys and filling stockings for good little girls and boys. 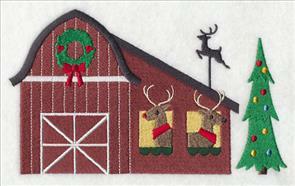 6.83" x 4.71" and 3.85" x 2.66"
As you stroll around Santa's village you'll also find the reindeer's stable and a wreath shop. 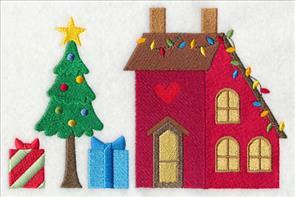 Stitch these charming houses to build a lovely Christmas scene. 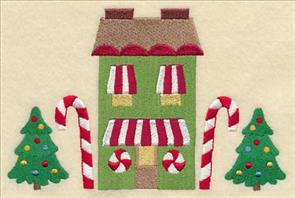 6.84" x 4.26" and 3.85" x 2.41"
Santa's hometown also includes a candy shop, and a hot cocoa shop. 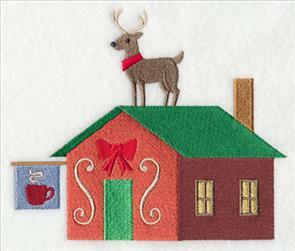 The reindeer love hot cocoa, and visit that shop often. 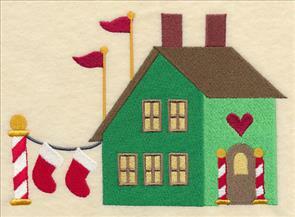 5.72" x 4.83" and 3.85" x 3.25"
A saltbox house decorated with lights is bright and merry on stockings, pillows, and tree skirts. 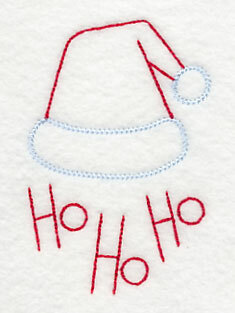 And, country-style snowmen outside a bow shop are charming on towels and table linens. 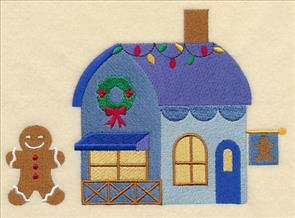 6.85" x 4.75" and 3.85" x 2.81"
Santa's village has a bakery, with a delicious gingerbread man outside the door. 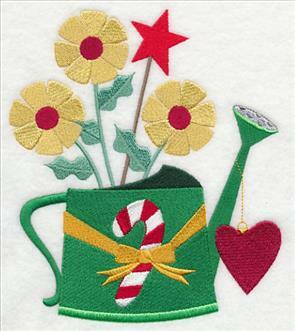 And, plant the poinsettia greenhouse on pillows and stockings for a colorful touch. 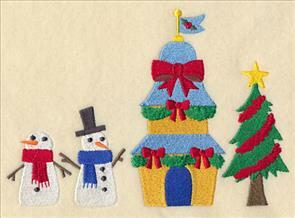 6.85" x 4.43" and 3.88" x 2.50"
Build a classic, country-style Christmas town with these designs! 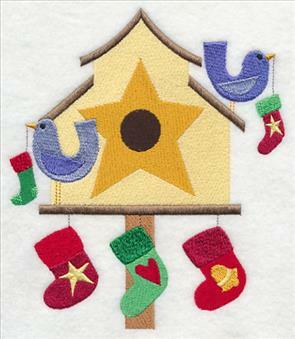 Add them to stockings, tree skirts, pillow covers, and towels - they'll add a cheerful spirit to your projects! Order them individually by clicking the links above, or buy all twelve in a pack. 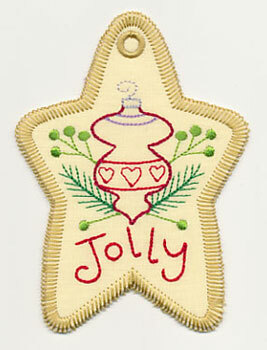 Add an extra-special touch to your Christmas gifts with tags, made right in the hoop. They make excellent ornaments, too! Your friends and family can take the tags off the packages, and hang them right on the tree. 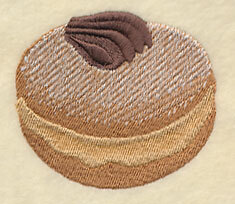 Light and delicate stitches bring that cozy, country feeling to the tags. 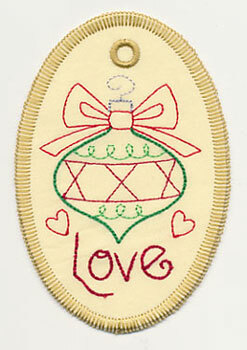 If you're new to making in-the-hoop gift tags, the project instructions are right here. 3.49" x 4.76" and 2.83" x 3.86"
The elements on the gift bags are light and open, reminiscent of that classic country, Americana style. 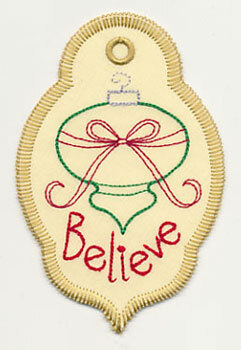 Words like "Believe" and "Ho Ho Ho" add holiday charm on these gift tags and ornaments. 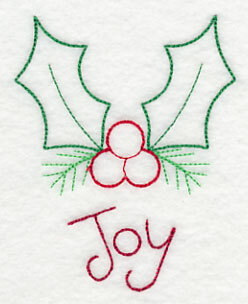 3.42" x 4.75" and 2.78" x 3.86"
3.35" x 4.75" and 2.73" x 3.86"
Stitch love and joy with a creative spirit! 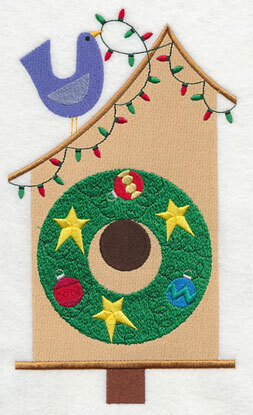 These gift tags are made right in the hoop, with a fabric back and a light border. They are adorable accents to gift bags and boxes. 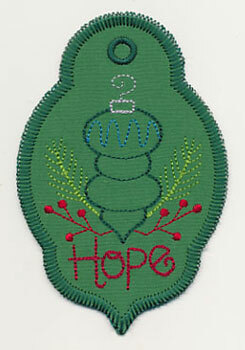 3.23" x 4.76" and 2.64" x 3.89"
A classic ornament is paired with a pine bough, berries, and the word 'Hope.' Project instructions for making gift tags in the hoop can be found right here. 3.11" x 4.75" and 2.53" x 3.86"
The elements from the gift tags are also available. 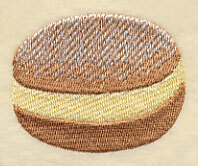 These light designs have few stitches, few color changes, and open areas. They're fast additions to kitchen towels, quilt blocks, and gift bags. 3.22" x 3.85" and 2.04" x 2.43"
Tuck these light and breezy designs onto tea towels, placemats, and linen napkins! 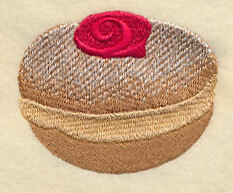 They're quick to stitch, and will dress up your table linens in a flash. 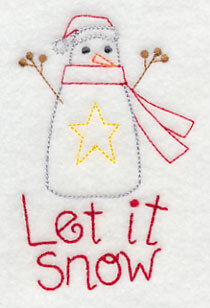 2.55" x 3.86" and 1.59" x 2.37"
Snowmen and stars are sweet on linen placemats and table runners, and napkins, too. 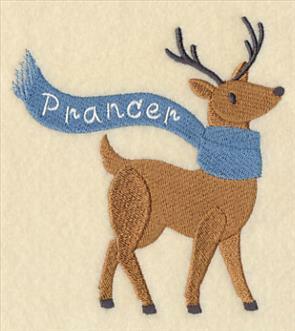 Add to pockets of aprons and gift bags for a festive touch. 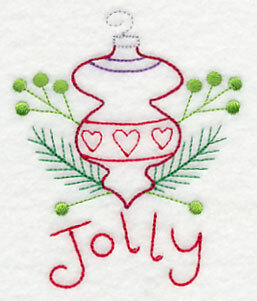 2.79" x 3.85" and 1.98" x 2.73"
An ornament is paired with the word 'Love,' and a sprig of holly is accompanied by the word 'Joy.' 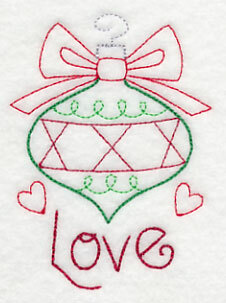 These designs are quick to stitch on table linens and scarves. And, they're beautiful additions to Pashmina shawls, too. 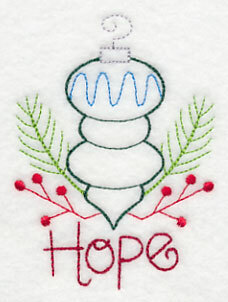 3.11" x 3.86" and 1.99" x 2.47"
An ornament is accompanied by the word 'Hope.' 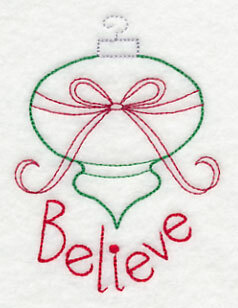 Add Christmas charm to dishtowels with this design, and others shown above! 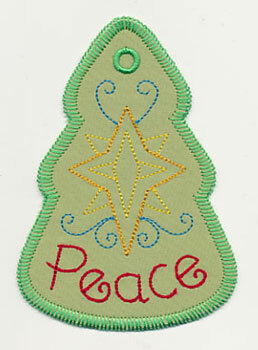 2.82" x 3.85" and 1.89" x 2.58"
Add a crafty and personal touch to your gifts with these designs! Recipients can take them off the gift, and put them right on the tree. 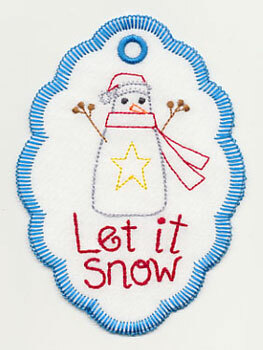 The 9 gift tags - with coordinating designs - are available in a pack! 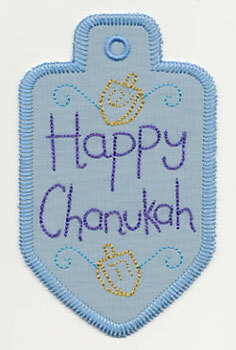 Chanukah begins on December 16th, and these in-the-hoop gift tags are a crafty and creative way to mark your gifts. 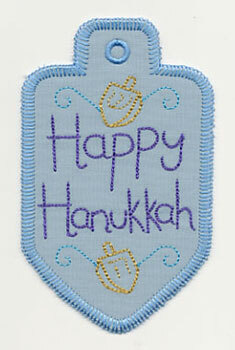 "Happy Hanukkah" is on a tag in the shape of a dreidel - the design from the tag is also available for individual use. 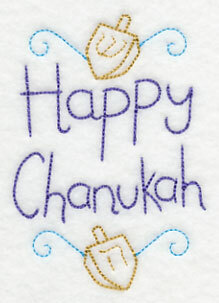 2.80" x 3.86" and 1.94" x 2.68"
A "Chanukah" version is available as well! 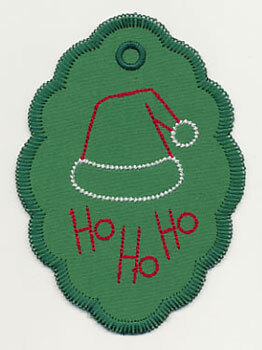 The gift tags are made right in the hoop with a fabric back and sleek border. You can see an example of how the tags are made in this tutorial here. 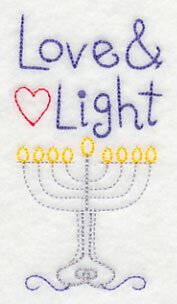 2.69" x 3.86" and 1.87" x 2.68"
A menorah is paired with the phrase "Love & Light." 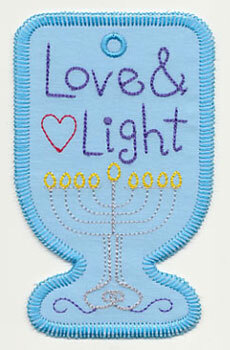 Most Hanukkah menorahs have nine branches, with the shamash (servant candle) at a different height than the others. 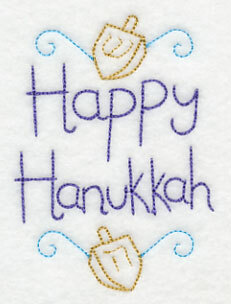 2.08" x 3.85" and 1.74" x 3.22"
Hanukkah is also known as the "festival of lights," and as each candle is lit, we remember the history, miracles, and wonders. 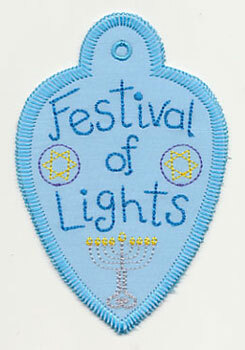 This gift tag features the text along with a fully-lit menorah. The gift tag is shown on the left; the right features the design from the gift tag - beautiful on tea towels and linen napkins! 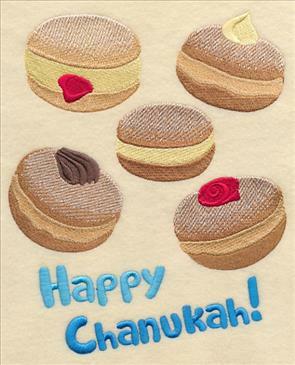 2.75" x 3.86" and 1.96" x 2.74"
Jelly doughnuts (sufganiyot) are a traditional treat during Hanukkah. They're deep fried, filled with jelly or custard, and dusted with powdered sugar. 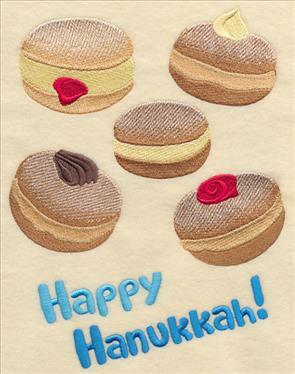 A collage of these delicious creations is shown below, paired with Happy Hanukkah (or, if you prefer, Chanukah) text. 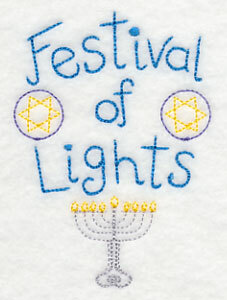 Add to tea towels and placemats, and bring a flavorful look to your Hanukkah celebrations! 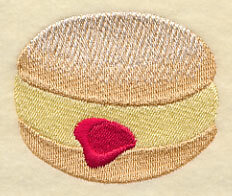 6.90" x 8.43" and 5.85" x 7.42" and 4.74" x 5.92"
The doughnuts and the text from the above medley have been separated from the larger medley. Add them to napkins, gift bags, and towels! 5.59" x 2.25" and 3.90" x 1.57"
2.70" x 2.51" and 1.79" x 1.66"
2.80" x 2.53" and 1.85" x 1.68"
2.82" x 2.32" and 1.86" x 1.54"
The Christmas Around the World designs feature saltbox houses dressed up for the holiday, and paired with "Merry Christmas" in different languages. You can see them here. Lotte from Denmark wrote to request a Danish version, and we are happy to oblige! We're looking forward to seeing what you make with the design, Lotte! 5.06" x 4.85" and 3.86" x 3.70"